I’ve got my dates now: Episode 36, filming January 27th, airing on Fox Sports Net on January 28th. The show is now being shown on FX over here. That makes four programs on that channel, alongside X-Files, Highlander and Cops. But obviously those stalwarts of the schedule get top priority and Pokerdome is squeezed on at 2am. I’ve put it in Sky+ and will try to work out how far behind we are. They’ve confirmed that this is for one person only. Although it’s unlikely Claire can get time off during term time anyway so I’m almost certainly going alone. Which will be strange. If they book it for Fri-Sun though it won’t be a direct BMI flight. At the very least I need to try to get them to make it Thu-Sun and then I can get diamond club miles too, as well as stand a chance of being awake when the tournament starts! Have to make sure they’ve heard of other airlines than Virgin so I don’t end up having to get to Gatwick! If I’m only going to be there for a weekend, a 24 hour round trip journey is an absolute upper limit, don’t you agree? 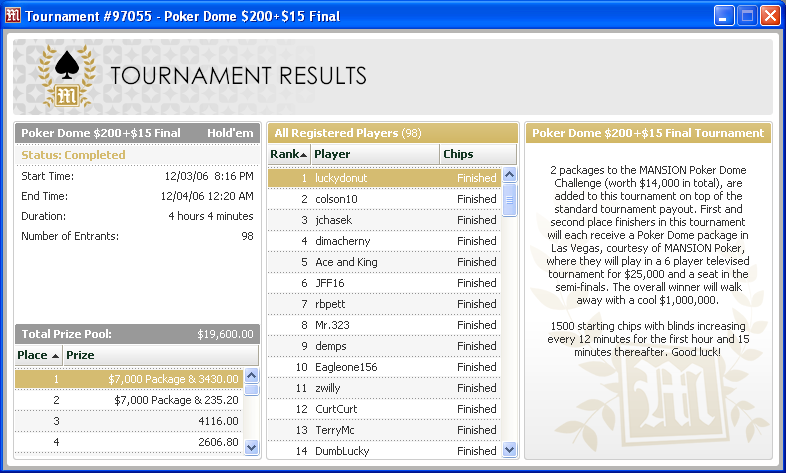 http://kickasspoker.blogspot.com/2006/10/mansion-poker-dome-rules-and.html. A limo with attitude. Never stayed at Caesars. Always said its probably where I’d choose if money was no object, and I said that even before they had a card room. So this is pretty damn cool. Sounds like this is actually just five black chips, according to http://pokerworks.com/article-674.html. Play em or cash em… well I can’t see there being any tables games lower than $25 minimum at Caesars on a weekend, so I’ll probably cash em. Or, I could try to do some real life rampaging at $2/$5 NL and see how just far I can spin it up…! Oh God, I have to be sociable? After an 11 hour flight? At like 5am UK time? Is this optional? Why they’re not putting us in a Downtown hotel I don’t really know. I’d probably still want a ride from the El Cortez at night, but anywhere else saves them a load of hassle. If it’s good at the Cheesecake Factory, you can be sure I’m going to be trying to smuggle a couple of those bad boys back home. The tournament itself is a three round, six-handed, speed poker shootout for a million dollars. 15 players stand between me and $1m – hey, it’s just like Who Wants To Be A Millionaire! And, if this article is to be believed, you can almost ask the audience too. 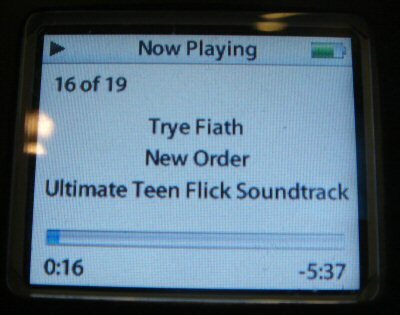 There’s also that annoying drone of tension music all the way through. If I beat five players, I win some money that I can’t lose and get to come back for more. It’s $25,000 for round one, and a further $50,000 for round two. Second place gets diddly squat though. The speed poker element is that you get 15 seconds to make each decision and there are two dealers to keep the cards flowing quickly. In the rules I’ve been sent (which, incidentally, are all TV rules, and nothing to do with poker) state no logos on clothes, no ipods, and no recourse whatsoever if they decide to make stuff about you to make the show more interesting. "I hereby release Producer from, and covenant not to sue Producer for, any claim or cause of action, whether known or unknown, for libel, slander, invasion of right of privacy, publicity or personality, or any other claim or cause of action"
"I understand that there is a possibility of i) risk of injury to me or others and/or ii) damage to either my property and/or the property of a third party as a direct and/or indirect result from my participation in or connection with certain activity(ies) which may be included within the production of the Program." Is anything better than free mince pies? Tesco have been giving away a free box of mince pies with every grocery delivery lately. 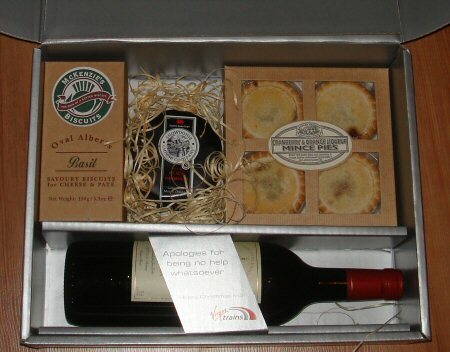 A nice little bonus for sure, but these may well be the sweetest mince pies of the season. 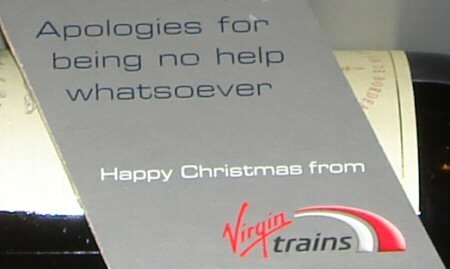 A very nice, completely unexpected freebie from Virgin Trains no less! Pies, cheese and booze. The perfect combination. Full report to follow, probably. 22:54. Quickest edit ever. I’d just pressed "save" on this, and it dealt me QQ with a raise in front of me. I took it down with a reraise though. Whew, as they say. 22:57. Second quickest edit ever. Same situation, this time JJ. Apparently I’m second in chips after that resteal! 23:30. Brief update at end of 3rd hour. 5 left and I have 2 grand in the bank. I’m second bottom in chips though and the blinds are mental. I think it’ll be over pretty quick either way. And like twenty something shopping days to Christmas, if you care about that. If I had a Las Vegas advent calendar, it would definitely need to have a picture of a cactus dressed up in Christmas lights. I would have said this even before hearing about just what they do to the Ethel M cactus garden. As if cacti aren’t cool enough. The chocolate factory is cack but I’ll definitely be going back to get a camera full of pictures of lit up desert plants. Meantime, and seeing as how Santa will have been and gone by the time I can post one of my own, here’s a shot from the Las Vegas Review Journal. A new month, so a new player points quota to hit to retain GoldStar status on PokerStars. And retain it I must, because I know I’ll never actually get around to redeeming my FPPs this month and most of the stuff I want is for GoldStar and higher. Now I know I said I was gonna keep plugging away at $2/$4 and probably rack up 10,000 hands this month, but it was doing my head in. 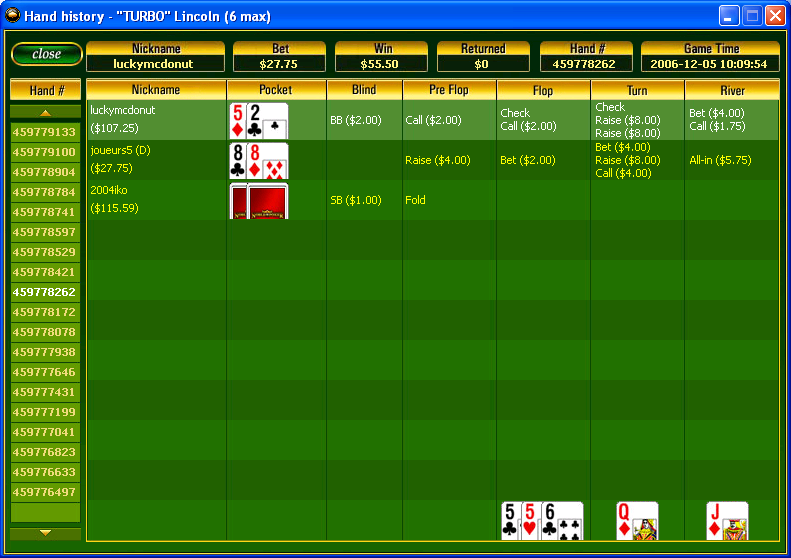 I had to take a break, so I spent some time playing $50NL and $100NL and the occasional pot-limit table. Had moderate success but don’t have anything like enough hands to know whether I’m really going to turn a long-term profit on those games. I have been given a hot tip though, a site to play at that is apparently very soft. I take this with a pinch of salt, although the reasoning makes sense. 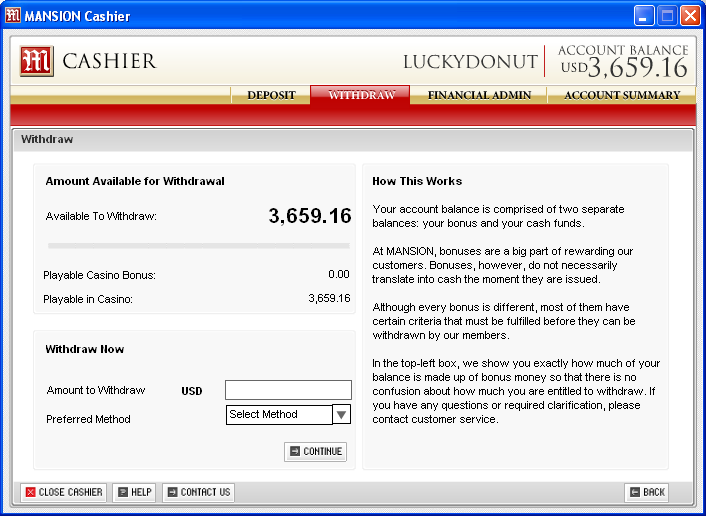 It’s a bookmaker that has just added poker and is marketing it exclusively to its existing sports bettors. If it’s any good I’ll be sure to comment, and if it’s not then I’ll probably even name it Only have a couple of sessions, but when I doubled up on $100 NL with my TT flopping top set against a T2 eventually made two pair, it seemed like a good start. Yummy. It’s time to focus again, so I’m back to mutli-tabling fixed limit. For a while at least. I have a hypothesis from today’s session: $3/$6 is a better game for me than $2/$4 on PokerStars. Yes I know it’s a small sample size and one winning session doesn’t make me a champ, but for the first time in ages I felt comfortable at these tables. I’d started at $2/$4 but seen that there were four tables at $3/$6 that were considerably looser – about 35% VPIP - and hardly any waiting list for any of them. They played much more like the $2/$4 I was used to from PokerRoom, before they dumped their American players. 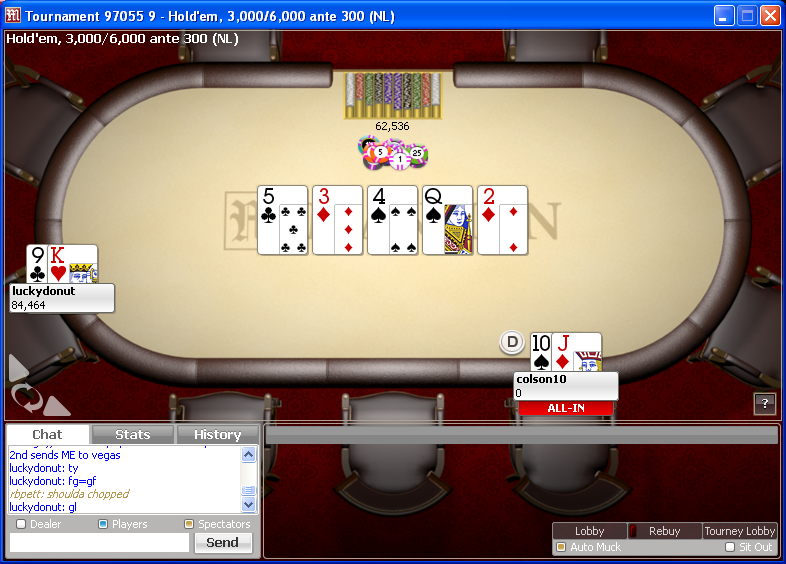 At times they even played like the fantastic $2/$4 games in Vegas with 6 or 7 players to a flop. Definitely going to be keeping a closer eye over the weekend and see if I can find out whether I’m better suited to $3/$6.